Soyini Chism, a doctoral student in the Curriculum Leadership program and a physical education teacher at Joliet Central High School, published an article in the Kappa Delta Pi Record. 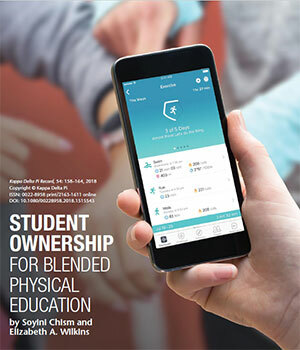 Co-authored with Department of Curriculum and InstructionProfessor Elizabeth A. Wilkins, “Student Ownership for Blended Physical Education” explores how the Joliet Township High School Blended Physical Education program combines physical activity with technology to empower students to take ownership of their learning and fitness. Students used the Fitbit fitness tracker and several health apps as part of their learning experience.